Thank you all very much for supporting me and my trip to Vancouver! The hats has been send off, a few things are still to be made, suitcases to be paccked… and a goal to reach. I am, thanks to you people, very close, but for the last 30% I still need a little help! So please tell your friends and family about my project, about the cool rewards, and how important it is… Every single Euro counts, every single Euro is needed. So, it´s official, I´m on my way to Vancouver… Well, so far the hats are on the way, they just got picked up, and I managed, even with my damaged finger, to get it all done. Okay, almost all done, one piece is still here, will come with me in the suitcase, when I leave in 2 weeks. Again, thank you so much to all of you, who have supported me already!!! A short update from the workshop, were hell is loose. All the Hats going to Vancouver are being picked up in 12 days, and ofcourse I am far from done. But mostly I am just happy, that we found a shipping company, who are willing to worry about the transport, cause that was not as easy as you´d might think. and talking about shipping: as the transportation are taken 1/4 of my total budget, please support me! I really need it. And then a HUGE THANK YOU to all of you, who are supporting me so far, I really appreciate it! This project ended successfully on 13/3/2017 09:00! Going International is mostly about traveling, often long distances. That’s why you get a travel set with a sleeping mask, earplugs to save you from the snoring guy next to you, and an inflatable neck cushion for a more comfortable flight. And for the shorter distances; The Thermo Mug-To-Go, keep your drinks warm on the ride. With that follows a huge thank you! As (one of) the First, you´ll get the Hattitude AW2017/18 Catalog, and are free to pick any one Hat from here, which I send to you. And with my deepest appreciation. 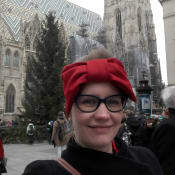 Hi :) I am Christina, a trained Milliner from Denmark, now I live in Vienna, Austria. Since I was a little girl, I´ve been wearing Hats, and finding out, that it was possible to become a hatmaker, I knew what I wanted. I love working with my hands, and enjoy how all sorts of Material can be turned into a hat or headpiece. No idea is too crazy, everything is possible.